This page is part of the chapter “Polish Grammar“. (z) kim? – with who? / with whom? (z) czym? – with what? The Instrumental Case always refers to the object of a sentence, never to its subject. As the preposition z (with) is not mandatory in the Instrumental Case, it is shown in brackets. There is no equivalent to the Instrumental in the English language. There is no direct equivalent to the Instrumental in the English language. I go for a walk with my brother. Idę na spacer z moim bratem. Find more information on this topic below. Combined with the preposition z (with) for expressing “company”. It is also used in other expressions, such as: ciasto z jabłkami (pie with apples), kawa z mlekiem (coffee with milk), dom z ogrodem (house with garden). For expressing the tool or instrument you use. In English, you would use the preposition “with”. In Polish Instrumental you don’t use a preposition for that construction. For expressing profession, relationship or nationality. In most cases, combined with the verb być (to be). In English, you would use the Nominative Case for this construction. In combination with several vers: być (to be), interesować się (to be interested in), zostać (to become), okazać się (to prove to be) etc. For expressing relations, e.g. with the following prepositions: nad (over), przed (before / in front of), pod (under), za (behind), między (between). For expressing time and location. idę ulicą (I’m walking on the street.) etc. In other expressions as a so-called logical subject. The declination of nouns in the Instrumental is quite easy and has only a few irregularities. All masculine nouns in Instrumental have the ending –em. The “soft” consonants -ś, -ć, -ń, -ź at the end of masculine nouns are transformed to –si; -ci; -ni; -zi in the Instrumental Case. In short, the diacritical mark (the acute accent on top of the letter) is being removed and the vocal -i is attached. With masculine nouns with the ending -g or -k, an –i is added before the Instrumental ending –em. The few masculine nouns with the typical female ending -a act like feminine nouns in terms of declination. Find more information on the declination of female nouns in the chapter “Nouns in the Instrumental Case: Singular, Feminine” below. The declination of neutral nouns and the corresponding rules are mostly (but not always) identical to the masculine. That means, in the Instrumental Case, all neuters also have the ending –(e)m.
As these words end with -e, they’re only attached the ending -m.
Neutral nouns ending with –o (which is most of them) are declined the same way. The only difference is that the ending –o is replaced by –em. The last two examples show the special case of the added –i after g and k. The same rule applies as with masculine nouns. 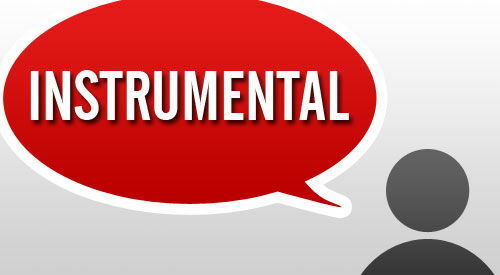 All feminine nouns end with –ą in the Instrumental Case. With feminine nouns ending with –a in Nominative (which is the majority), the –a is replaced by ą. With the few nouns ending with i, the letter ą is simply attached. With the feminine nouns ending with -ś, -ć, -ń, -ź, the same rule applies as with masculines (-ś, -ć, -ń, -ź become -si; -ci; -ni; -zi), but they’re added the female ending ą.
Nouns of all genders are added the ending -ami in Instrumental Plural. As you can see from the examples, in most cases the last letter of the Nominative Plural version is removed, and the Instrumental ending –ami is added. Words ending with -a in Nominative Plural are only added -mi. In other words, take the word stem of Nominative Singular and add the ending -ami. There are just a few exceptions to this rule (mostly with masculine nouns), where endings are merged. As mentioned above, the Instrumental Case always applies to the object of a sentence. Accordingly, adjectives describing the object in the Instrumental Case are also declined. As you may have noticed, the adjectives relating to female nouns in the Instrumental Case behave like their corresponding noun. That means: Adjectives relating to female nouns also end with -ą in the Instrumental Case. These sentences show, that the masculine and neuter forms of adjectives have the same ending (but not the same as their corresponding noun like with female adjectives), which is -ym or, less often, -im (after -g or -k). You have to learn all the above adjectiv forms in order to understand Polish. But also note that they’re quite rarely used in every day language. More often, they’re replaced by the Nominative form and the word “to” (in the sense of the), without the verb “być”. Auto jest drogim prezentem. Auto to drogi prezent. A car is an expensive present. Żywiec jest drogim piwem. Żywiec to drogie piwo. Żywiec is an expensive beer. Ona jest dobrą nauczycielką. Ona to dobra nauczycielka. She is a good teacher. Great video, thanks for creating and sharing it Darek! and as you can see they do not have the letter “i” after “k”. Świetna strona, szukałam czegoś co pomoże mojemu znajomemu w nauce i chyba nie ma miejsca, w którym przypadki byłyby opisane lepiej.